Gefran’s 1/16 DIN Microprocessor controllers are manufactured using SMT technology. These controllers provide a complete operator interface protected by a Lexan® membrane; This Technology ensures level IP65 faceplate protection. 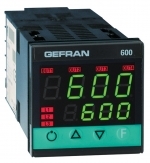 Gefran 1/16 DIN Controllers are also equipped with 4 keys, a 4 digit display (2 indicating LED's for 400 models) and (3 indicating LED's for 401 models) and a 3 LED's for bar-graph display. Sensor configuration is preformed from faceplate interface, of which no external shunts or adapters are required. A 2nd auxiliary analog input from the current transformer is also available. With the isolated digital input you can select: one of the two pre-settable set points, select Manual-Automatic mode, reset the alarms memory, or enable the hold function. The controller has up to 4 outputs: relay (3A, 250V) or logic (12Vdc, 20mA. The serial communication option (available in RS485 standard) allows connection to supervision systems and PLCs with two protocols: GEFRAN CENCAL and MODBUS RTU. Programming procedures are facilitated by grouping parameters in function blocks (CFG for the control parameters, INP for the inputs, OUT for the outputs, etc.) Possibility of selecting a simplified menu for entering the most frequently used parameters is also available. Consequently, a programming kit for PC is also available to facilitate the configuration a step further. Configurable from keyboard - Universal input. Accuracy at nominal conditions is tighter than 0.2%. Optically isolated RS485 serial line.